The Hermes Birkin is the most sought after, impossible to find and collectible bag ever made. The standard Birkin design we know now and love was created jointly between Hermes CEO Jean-Louis Dumas and the actress Jane Birkin. Jane complained that her Kelly bag was not very practical and Jean-Louis Dumas suggested he come to their workshop and make her a custom bag. Jane’s Birkin bag was modified from an existing Hermes design, the Haut À Courroies (more on that later) to be shorter and smaller, but with handles for toting over the arm. Jane Birkin was gifted the first 40cm Birkin bag in 1984, and the rest is history. Unlike other handbags, a single highly-skilled craftsman works on one Birkin at a time with the construction of each Birkin bag consuming somewhere between 18 and 30 hours, depending on the specifications. The bags are handmade in France by expert artisans using the company’s signature saddle stitching, developed in the 1800s. One single artisan takes complete responsibility and ownership of the Birkin they are creating. Hermes is still family owned and values craftsmanship above all else. Birkin retail prices range from $10,500 to $150,000. Due to the fact that each bag is handmade and no two bags are alike, prices vary according to the type of leather and hardware. Hermes “Special Orders” (SO) allow VIP clients to customize nearly every aspect of their Birkin from size, color combos, leather, and hardware. The bags are distributed to Hermes boutiques in very limited quantities, creating scarcity and exclusivity. Birkin bags are investment pieces that hold or increase their value over time. As of June 2017, an Hermes Birkin was the most expensive handbag ever sold. For the outstanding price of $379,261 (2,940,000 Hong Kong dollars), a matte White Himalayan Niloticus crocodile Birkin with more than 240 diamonds on its 18-karat-gold hardware could be yours at a Christie’s Auction. Due to their exclusivity and Hermes’ affinity for secrecy, the information you find about Birkin bags can be pretty limited. The sizes, measurements, terminology and colors can leave you feeling lost–but Yoogi’s Closet is here to help guide you on which Birkin to add to your closet. This guide will cover the sizes and differences of the classic Birkin, the HAC Birkin, and the Shoulder Birkin. The classic Birkin bag has a very distinct design that has inspired thousands of handbags across the world. Birkin bags have two handles, a flap closure, two leather buckle straps and a turning knob with a loop for a padlock. 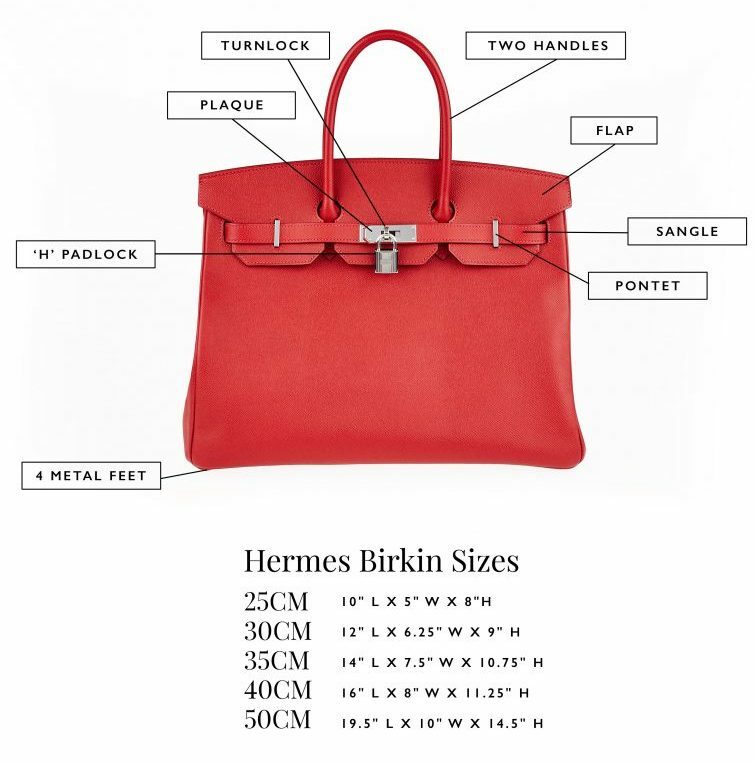 The names of Birkin bags references the length of the base measured in centimeters. Birkin bags have four feet on the bottom to protect the leather base, though larger sizes (50cm, 55cm) will have six.